This blog has been set up as a result of my world trip. I discovered on my journey that the natural world is under increasing pressure and surpassing limits. I also saw the natural world as our true nature. I realised what we do to ourselves we do to the natural world. The two are intimately connected. This blog is to inspire people to reconnect to peace as their own true nature. When you change the world changes. On this blog you will find my Journal documenting aspects of my life’s journey and inspired poetry. Also I have photo’s in my Photo and Video galleries. WorldPeacefull is a funny business dedicated to the principles of unity, empowerment and shared stewardship of the earth. I instinctively focus on these issues with a sense of humour or en-lighten-ment. I am the creator of WorldPeacefull, a Rotary Peace Fellow and Graduate in Peace Studies (2002) in Australia. I have an Economics and Marketing degree and have had extensive experience in market research. I have conducted research into the areas of: peace, non-violence and laughter in relation to conflict resolution, anti-bullying and world peace. I assert that peace is our true nature, when we find inner peace we find external balance in the world. This is the foundation to real sustainability. Values are the key to sustainable change that benefits people and the environment. 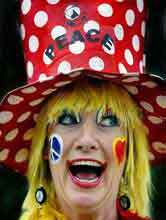 I (Peacefull) have entertained the public as a World Peace Clown in hospitals and public spaces since 2000. The purpose of clowning is to bring laughter, healing and joy to create a sense of unity between people. Clowning also facilitates personal development in respect of learning unconditional love and self confidence. This is a primary basis for our true nature. This blog is a discussion blog that will explore peace in a range of dimensions. It is to inspire peace, balance and a deeper understanding of our nature and the natural world that we have come from. I have added an RSS feed for those who would like to keep up to date with my Journal entries.